Help Change a Child's Life! Over the years, funding for special needs products has become more difficult. Insurance companies are funding less, and the equipment prices are staying the same. So what is a family in need to do? 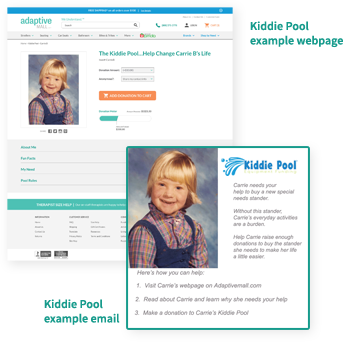 The Kiddie Pool is a FREE Service Program that works like a fundraiser. Your family joins the program and a custom webpage is created for your child with special needs. Included on the webpage is a photograph of your child, your child's story, products desired for your child and fun facts about your child. This webpage is designed to be shared with friends and family through an email campaign. Adaptivemall.com does it all for you...FREE OF CHARGE! It really makes it easy for family members and friends to give something they feel makes a difference. Quick responses from the team. Easy to set up. I love that the left over money gets stored away so we can use it in the future. Easy to work with and the people helping me set is up were GREAT! I liked the help I received setting up my sons page. I liked that people could go online and donate and I liked the updates I received throughout the process. Your friends and family can help, after all they are always asking me how can they help. Adaptivemall.com will create your child's webpage using the photograph and information you've uploaded in the sign up form. This will take 2-5 business days. Adaptivemall.com will prepare an email and send it to you. You will forward it to your friends and family directly. The email will link your friends and family to your child's Kiddie Pool Page where they can choose the amount of their donation. Adaptivemall.com will notify you when each donation has been made and when you reach your desired goal. Once your goal is reached, you can order the child's equipment. For more information, please call our Customer Service Team at (800) 371.2778.